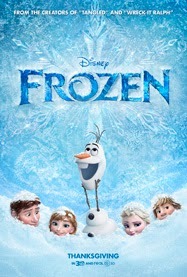 Alex J. Cavanaugh: Frozen Movie Review and December Movie Preview!! Plus Curiosity Quills and the IWSG, and Some Awesome Ninja News. Frozen Movie Review and December Movie Preview!! Plus Curiosity Quills and the IWSG, and Some Awesome Ninja News. I was asked to do an article about the Insecure Writer’s Support Group for Curiosity Quills! It’s up today at their website. Inspired by Hans Christian Anderson’s The Snow Queen, Frozen is the story of two princess sisters, Anna and Elsa. When Else’s secret powers plunge their kingdom into an eternal winter and she runs away, Anna sets off to find her and make things right. This is a very sweet story, genuine and innocent. It’s not an epic story, but it’s really enjoyable to watch. The strength of the story lies with the sisters, especially Anna. She is a true heroine. She’s also a combination of resourceful awkwardness, which makes for some humorous situations. Olaf the snowman is a riot. Most of the humor comes from his optimistic sweetness and desire to experience summer. Sven the reindeer is also funny. If you’re looking for a sweet story about love and family devotion, wrapped up with amazing animation and great humor, then this is your film. Highly recommended. Roland Yeomans is this month’s featured Challenge participant at the A to Z Blog. His theme was “Words of Wisdom for Writers,” so check it out. Those of you signed up with The Fussy Librarian - CassaStar is the featured science fiction book for Tuesday this week! 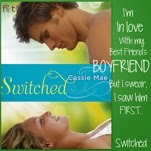 Cassie Mae’s Switched is out today – congratulations, Cassie! CD Coffelt’s prequel to Wilder Mage, Out of Magic, is available for free on Tuesday, December 3. Created by Pat Hatt of It’s Rhyme Time have been working on a project - Translate Your eBook. It’s really awesome, so visit his SITE for details. Sean McLachlan is looking for beta readers for his next novel. Radio Hope is a post-apocalyptic thriller, sans zombies, and it comes out February 1. Details HERE. Also, check out his "How Can I Help You?" page for some cool stuff he offers. 1. CBW-LA.ORG, my nonprofit group, is donating 50% of its book sales (for STORY SPROUTS: CBW-LA WRITING DAY EXERCISES & ANTHOLOGY) from Nov. 2013 to the end of Jan. 2014. Find it on Amazon HERE. 2. 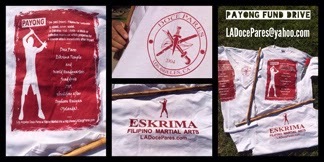 Doce Pares L.A., my Filipino martial arts group is raising money through the Payong Drive campaign. Basically they are selling shirts for $20 each. 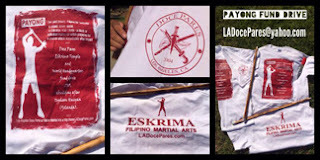 Up to Dec.15, if you have other friends/relatives interested in supporting our fund drive, send the number of shirts and sizes (Small up to 3XL) to: LADocePares@yahoo.com (Sizing Chart) You can make checks payable to "Erwin Mosqueda" or via Paypal: PayongFundDrive@gmail.com Local U.S. shipping and handling will be free (except Hawaii, Alaska & Puerto Rico). Visit Kickstarter HERE for more information and to contribute. Good luck, David! CheersFest 2.0 is one week away on December 9! We are roasting Lee ‘Arlee Bird’ of Tossing it Out. 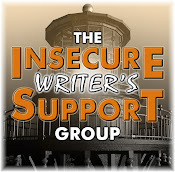 The next posting for the Insecure Writer’s Support Group is this Wednesday. 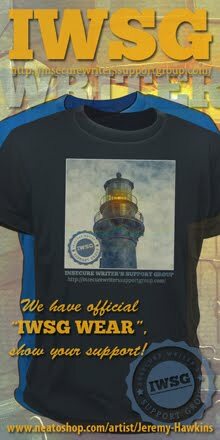 There will also be a cool contest with some awesome prizes announced at the IWSG Website on Wednesday, so don’t miss it! Here are the upcoming movies for December! As always, descriptions courtesy of the IMDB. Snarky comments by me. It’s Christian Bale month – he also stars in American Hustle, coming out on December 20. Despite the haters, I still thought the first installment was amazing and can’t wait for this one. Bring on Smaug! The first one really wasn’t the funny, but I give them credit for hyping this one to the max. Sappy, sentimental, and feisty – one heck of combination. Sure it will be really good as well. Did everyone have a great Thanksgiving? Did you see Frozen? Anything in the Ninja News catch your eye? Ready for the IWSG post this week? And what movies are looking forward to in December? Don’t forget to visit Curiosity Quills! Sounds like you and the Missus had a nice, relaxing time during Thanksgiving - and mightily so! Thanks for the review on Frozen. I was a bit cold toward it, but you've thawed me out and I think it's a cool movie now. Looking forward to see Frozen. Sounds perfect for the holidays. Have a lovely week. I haven't seen a new movie in ages, but I do want to see Anchorman 2 - even though I didn't know about it until I read it here. I am so booked to see Frozen!!!!!!!!!!!!!!!! It's getting such rave reviews too!! Yay!! I'm sure I'll see Frozen at some point! nice....we will go see frozen....my boys have been talking about it for a bit...the newspaper review set it below the icons and even wreck it ralph, but it looks fun and well worth the see....the kickstarter video is pretty cool and i like the synnergy between the writer and artist....ha would be nice to be compared with RA Salvatore...smiles. M-Koo! My first chuckle of the morning. Stay chilly. Kitty, you will adore it. Brian, it's well worth seeing in the theater. Not a huge epic movie, but a good, solid film. I am emerging from my food coma. :) Thanksgiving was nice this year. Hope yours was too. I would like to see Frozen, but my son doesn't like going to movie theaters. Maybe I'll have a chance to check it out on DVD someday. I have to check out the fundraisers at The Writing Nut. Frozen sounds good. I'll have to check it out. And I'm definitely looking forward to The Hobbit, though I'll probably rent it. I'm excited to see Frozen. I really want to see Our of the Furnace. And I still need to see Catching Fire!! Totally didn't put two and two together... I had a friend complaining about Disney getting its hands on Snowqueen... apparently the fairy tale is much darker, but the people talking about Frozen have liked it... this is the first time I knew they were the same thing... Call me clueless. Taking my little niece to see Frozen next week. I agree with you about The Hobbit, and can't wait to see the next movie! Going over to check out Curiosity Quills. At this time of year people are overwhelmed with giving opportunities which are all good. And I wish it was a year long process of giving and helping. Once again, Ninja Captain, I did a double-take reading your post. Thank you times three for the shout out. You are one cool dude. I can never get enough Disney or Pixar movies. Call me a kid who never grew up, I reckon. Lots of great stuff to check out today! I can't believe how often Anchorman 2 has been pushed during football games with the Dodge commercials. I am already tired of the movie because of those LOL. Looking forward to co-hosting the IWSG on Wednesday! I'd love to see Frozen. As a child I was mesmerized with every Hans Christian Andersen story especially The Snow Queen, The Wild Geese, The Red Shoes and The Tinder Box, and still can't rid them from my mind. I would really like to join the Insecure Writer's Group, but I'm too insecure to take the first step (and will I cope with the html? La,la,la,la. I need help! Got my IWSG post ready already! Saw some stuff on DVD - THE EAST (a good thriller), THE INTERNSHIP (funny!) and re-watched THE HUNGER GAMES in prep for seeing the next one soon. Can't wait to see THE BOOK THIEF but since I know it will be sad, I'm gearing myself up for it slowly…. I had a nice TG, albeit early because I had to work. Laura, it was a really cute film. Hart, it's inspired by, but it's a very different story. Carol, you are most welcome! Julie, I bet the Dodge commercials are funnier than the actual movie. Fanny, you can't be too insecure - join us! I love Frozen! I think it is a Disney classic. I plan on seeing Out of the Furnace, Desolation of the Smaug, and Saving Mr. Banks this month. 47 Ronin looks terrible and scary. I loved Frozen. It wasn't what I thought it would be so I want to see it again, but it was a lot of fun and really sweet and I liked the ending. My dad wants an ice castle too now. Can't wait for The Hobbit! So nice to hear someone who wants to see if and isn't complaining about changes made. I liked the first one a lot and am eager for this even more, except for the spiders. I loved Olaf! He was so cute. Looking forward to The Hobbit. Thanks for the shout, will be watching frozen soon to. Stupid Anchorman, I don't see how it is funny, maybe here and there at best. Already sick of the damn thing. I will get to see some of these movies eventually. I recently bought some old movies - Bloodsport being one of them, thoroughly enjoyed it again. Frozen has not been on my list of to-see movies. I guess it's just something about going to a theater and having to say, "Yeah, two adults please. No, we have no children. We're just seeing this ourselves." May have to reconsider that, though. Frozen sounds like a fun movie and it's nice to see them going back to the old fairy tales. Thanks for supporting Nutschell's fund raising. She has a big heart. I wasn't sure about Frozen, but now I will definitely see it. Thanks, Alex. So glad you and your wife enjoyed your holiday. I think you should build her an ice castle! How exciting to do an article for CQ! Yay, you! I totally want to see Frozen. Is that weird? Melissa, I'll start carving tonight! Jack, I liked Frozen more than I thought it would. And I have no problems with the changes in The Hobbit. Pat, I still remember the one and only funny line in the first film - I killed a man with a Trident. Brandon and Bryan, my wife and I did that! Go see it. Perfect timing - thinking about taking my daughter to see Frozen with a few friends for her birthday. She's 12, so moving into YA books movies - I just let her watch Hunger Games - but I think she'll still enjoy Frozen - me too! Great holiday - didn't see a movie tho. Looking forward to the hobbit too. I had a very nice Thanksgiving, and like most anyone, ate too much! Now Frozen sounds like it's right up my alley. And though I wasn't all that impressed with the first installment of The Hobbit, the second one's got a dragon in it so it's gotta be better, right? Had a great Thanksgiving. Hope yours was great too! I taped a documentary about P L Travers the other day - looking forward to watching it, and very tempted by the film. I was quite literally forced to see 'Frozen' this past weekend, and I am glad. It was delightful. The music, the characters ande the animation were amazing. Good thing you reminded me about the IWSG. Can't believe it's Dec already. Only 23 more days until Christmas. Yippee! Sheri, go see it! Kids not required. Kristen, I'm MUCH older and I enjoyed it. Bish, can't go wrong with a dragon. Faraway, glad you liked it. Wow, what a feast of book recommendations you have given us! :-) Many thanks. I decided not to do any shopping over the holiday, and it was fantastic! I'm VERY behind on my movie watching. Haven't even seen Ender's Game, Thor, or Catching Fire. Hopefully, I'll catch up soon. Yes, I go with my son to see Frozen! I loved frozen, though, as you said, it's not as epic as other Disney shows. Ooh! You're on Fussy Librarian tomorrow? I'm watching for it. Super cool. So much amazing stuff happening...I'm off to check it out! I'm looking forward to 'The Hobbit' and hoping to check out 'Saving Mr. Banks' too! Cassie Mae's book! I follow her blog. Thanks for posting! I heard Frozen was really cute. I let my friends with kids filter which animated movies are worth seeing (LOVED Wreck it Ralph and How to Train Your Dragon, and of course, the Pixar movies). Maybe when I emerge from my writing cave I will get to see it--though Catching Fire and Thor are first. I loved Anchorman. I saw it in the theatre when it came out and me and my friends laughed louder than anybody. Obviously millions of people love it too, but I remember thinking, why isn't everyone else laughing? This is awesome. I also think Hot Rod is one of the funniest movies ever made, so that clues you in to my humor. Thanks for resourceful post as always! Hi Alex! Thanks for helping promote my two fundraising campaigns! So appreciate it! Also,I've been dying to see Frozen! Will definitely check it out after your awesome review. Frozen sounds very cute! I also can't wait to see Saving Mr. Banks. Congrats to everyone on their new projects. Glad you had a happy Thanksgiving Alex! Lot's of exciting news for Dec. I am waiting the new Tyler Perry movie Madea's Christmas due out this month. Glad you and your family had a Happy Thanksgiving! Now... going to peek at the links in your blog! Flawless. For once in my entire life, my thanksgiving was flawless. I was even able to squeeze some NaNoWiMo time in. I won. Yay! So much going on! Usually I don't see the animated movies.. but I might make an exception for Frozen. You have me intrigued. Well, I did like Brave a lot... so I can't say I never go. I really want to go see Frozen and so do my kids, but I just don't know if we'll actually have time to make it to it. I've heard great things about frozen and want to see it. Glad you enjoyed it, Alex. It was a great Thanksgiving. My son saw Frozen with his girlfriend - it sounds really cute. I loved, loved, loved Frozen! Then again, I knew I would. I dragged my boyfriend and he was surprised how much he liked it. Now we keep quoting it to each other. Holy wow! My video is on the Ninja Captain's wall! Thank you for sharing, Alex. As far as those movies go, I plan to see The Hobbit in HFR, 3D, THX and every other ridiculously expensive option there is! Just not opening night. That's for the birds. I'll see Anchorman, too. That was filmed down the street from me (figuratively speaking) and I have a couple of friends as extras in it (literally speaking). Jay, you need to catch up! Leovi, take him. You'll both enjoy. Stephsco, you will enjoy it. Anchorman wasn't funny to me, but I've liked other movies Will has done. Cassie, you're welcome! At least, you need to see it. David, you're welcome. And cool the movie was filmed near you. I'm sure Lana will bring Frozen home from the library eventually. We both like animated films. Hi Alex - thanks for the news and reviews. I'll be sure to look out for frozen! ... and I am really really looking forward to Part 2 of The Hobbit. How's the latest writing going? Great interview over at Curiosity Quills! I think that I'm going with a light-hearted and fun IWSG post for December. Okay, is it just me? Why in the name of Middle-earth are tv/media people pronouncing Smaug in that ridiculous fashion? It's driving me batty! 47 Ronin does look good, just hope it isn't one of those where the trailer is better than the movie. Frozen looks cute...think I saw a trailer on TV and my daughter wanted to see it. Looking forward to the Hobbit! I want to see Frozen, Hobbit 2, and Saving Mr. Banks. Should be a good Dec. for movies! Great book trailer. Looking forward to The Hobbit also. Thanks for giving the premise of Frozen! We'd see the previews and say, "What is this movie about?!" Some fun movies to look forward to and congratulations to folks getting their books out! Thanksgiving was quiet over at this end of the pond but still nice. Crap IWSG already?! It's December?! Where does the time go? I believe my daughter and her father went to see Frozen this past weekend. If not, I'll have to make it a mom and Chipmunk outing to see that movie. Thanksgiving holiday was a blast. And Ted has been stepped on thoroughly in my mind by Neo. I am ready for IWSG this week. I'm also looking forward to The Desolation of Smaug and more Christian Bale. Thanks for the Frozen review. My kids want to see it and now, I do, too! Sorry that that pesky incident in my parking lot has kept me from visiting until now. FROZEN does seem like it will be fun. I'm off to CURIOSITY QUILLS right now. My Thanksgiving gave me much to be thankful for. May Christmas month be fun for you! Looking forward to seeing Frozen and Saving Mr. Banks...and Wednesdays IWSG posts, of course. Congrats & best of luck to all the Ninja authors! I look forward to the next installment of the Hobbit. The dragon is rather exciting, yes? Congrats to Cassie Mae! Woot! I MADE IT HERE… FINALLY. I spent most of the day catching up. I am SOOOO thrilled to be back in the blogosphere! I've missed all of you so much. I am DYING to see FROZEN…. I must get to it soon. This week is out because of catch and revisions on my novel. Yup, finally getting back into writing. I have an amazing author working with me to really polish it up. Hope to get to my novella right after Christmas. Hopefully. Great to read all the news! IWSG… ALREADY… EEEK… okay, I need to incorporate my travels in with this post….. talk about Insecure… a GRINGO in a STRANGE and unusual place…. I'm falling behind on my Hobbits! Dominic, I'm working hard on the outline! Michelle, you're due for a movie! Deniz, maybe they are from the South...? Moody, my fear as well. Debra, the trailers didn't give away much. Elise, soon it will be Christmas! Melanie, God bless you and your frozen weather! Roland, you had a good excuse! Glad it wasn't worse. Michael, now that sounds like a fun IWSG post! Glad you are back. Check out all these links. Right, looked at them all. Let's see. Lee deserves to be roasted. The A to Z of roasting. Wednesday, I can hardly wait for that IWSG event. You know how I appreciate it. The Hobbit, based to some extent, on the town I live in. Nah, definitely not a Southern thing... they keep pronouncing it Smög for some weird reason. Driving me nuts! Thanks for telling me about The Writing Nut. I'll have to read up on their fundraiser. I haven't seen Frozen, but I've heard great things about it. I'm almost tempted to take my toddler to go see it with me! Frozen is high on my watch list for December. Also excited about 47 Ronin and Saving Mr. Banks. Congrats to Cassie and other authors with books out or specials. I really want to see Frozen now. I had a good Thanksgiving, if you don't count the slight stomach bug that put me out today. Frozen looks like a lot of fun! Will definitely have to see that one! :) Hope you had a great turkey day! Deniz, I'll have to listen to it again! I said Southern just because of the weird way they pronounce things here. Lynda, it's really sweet - you'd enjoy it. JE, that's why it says it was inspired by, not based on. Hey Jemi - good to hear from you. I'm so excited to see Frozen! Hi Alex! Hope you had a grew Thanksgiving. Mine was good. Honestly, I am not sure i want to see any of the new movies. If I had to chose maybe "Out of the Furnace." Cheers!! Thanks for the info about Frozen. Thought about taking my grandson to see it. He just turned 6. I want to see Frozen! Happy you and Mrs. AC took time to chill~ I know that was so lame-oops! I'm amazed by the quality and beauty of animation these days -- Brave and Finding Nemo are stunning. So I think I'll catch Frozen too. Of course you're raising money for good causes, Alex, since you're a good guy. The firm where I work has this year chosen to make its annual charity contribution to the Philippines' typhoon victims, so I'll pitch in there too. And as usual Meals on Wheels needs so much help, which doesn't make sense in this rich country of ours. 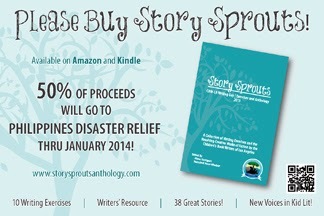 I highly recommend the Story Sprouts book. Lots of neat ideas to spark creative thought for writers as well as good practical information. And there's some excellent writing as well! Honestly, the only movies wifey and I have seen are the rude and crude comedies long with kids Cg flicks. The Heat. We're the Millers. This Is The End (not with the kids). Descpicable Me II and Monsters, Inc. II (with the kids). Oh, and I saw Thor. Yeah, I have a lot of catching up to do. I hope to see Frozen. I'll be ready for IWSG and upcoming blogfests. I wish I had some young kids around for an excuse to see Frozen. Sounds like everyone loves it. IWSG tomorrow night! Wow, don't the months fly by. Hildie! Good to hear from you. Helena, that was really nice of your firm to do that. Lee, already have it on my iPad. Carolyn, go anyway! My wife and I didn't go with any kids. Having grown up having Hans Christian Andersen stories red to me at bedtime, I will NOT be missing this one. I rarely GO to movies, as I've pointed out time and again, but this one I will. Hi, Alex. Thanks for sharing your review on FROZEN. The previews look really good. I definitely want to see this one. Lots of awesome news . . . can't just pick one to re-mention. My friends have been posting about taking their kids to see Frozen. Since we don't have TV, I had no clue about it until your post. I'll have to take the kiddos over winter break. So much news, Alex!!! Personally, I'm eager to see the new Anchor movie. Laughter really is the best medicine. I'm so excited to see Frozen! My friends and I are going tonight. And I literally CANNOT WAIT for The Hobbit. Thanksgiving was good. But my computer died. Roland is a gifted writer, I will have to check that out! I can't wait to see the new Hobbit too, even if the way the TV announcer says Smaug annoys the fluff out of me. And the furnace movie? First thought was...what a cheesy book cover. Hah! And we thought only indies got that sort of hate. Susan, it will still be around, as there is no competition right now. Mark, go to all of them. Yes, thank you, very interesting to me Saving Mr. Banks! I do want to take the kids to see Frozen. Glad there is humor! And I cannot wait to see Anchorman 2!!!!! Now we will see Frozen--having gotten your review. On T-Giving (on our lonesome) we went to see Philomena. An excellent movie with Judi Dench and Steven Coogan. We had turkey dinner--I think it was called the Dwarf feast, maybe. Frozen and Hobbit 2 will be awesome movies to watch with my children. So happy to hear about the help for Philippines project. What a noble idea! I hate to admit that I still haven't seen the first Hobbit movie! But there, I admitted it. Those are some great movies coming out in Dec. Frozen sounds like a sweet movie, and since I hate summer and am fascinated by winter, no doubt I'd enjoy being in a dazzling ice world as well for a couple of hours. Birgit, I think The Hobbit is a classic. Susan, a dwarf's fest at Denny's???? Trisha, that's all right, on both accounts. Frozen sounds like a wonderful movie for the holidays. Looking forward to IWSG tomorrow. Congrats for the book release, Cassie Mae! Congrats to Carol for her new FREE prequel - very generous. Sean already has a release date for a novel he wants beta readers for? Uh, ok. Good luck to him. Yay for Nutschell and her good works! I saw the post of CQ. AWESOME! Congrats to you & IWSG! I'm going to try to take my kids to see Frozen this weekend. Looks so cute. Saving Mr. Banks sounds like the type of film I might like to watch. Ronin also sounds promising, since I'm a longtime Nipponophile. My Thanksgiving was fantastic! I ate until it hurt (the right way to do things, obviously). I've heard that Frozen was excellent so I'll definitely be adding that one to my list. Yes, the Alex's Army does rock and I'm glad to be part of it. This was my first time participating in the Insecure Writers' Support Group monthly postings and it's been really fun. Thanks to all those who've put out great content on their sites, and most importantly, thanks to everyone who has left encouraging comments on my blog. I like your review of Frozen. It sounds like a simple sweet story that's not too over the top. December movies look pretty good from here- nice movie reference for 47 Ronin. There is so much going on right now that looks so exciting. I had a lovley Thanksgiving and hope you did too. I also went and saw GRAVITY which was fantastic. "The first one really wasn’t the funny, but I give them credit for hyping this one to the max. " Sums it up for me! And I am eager for "Saving Mr. Banks"...but it will have to be a rental.